Your best girlfriend or dearest sisters are the ones who always take your late night phone calls, celebrate big news with pizza and bubbly, and always know how to make you smile. So when I shop for the girls who mean the world to me, I like to treat them to indulgences (big or small) they probably wouldn't pick up otherwise. I'm always on the hunt for perfect coupes, so if you're bestie is anything like me, surprising her with a set of Kate Spade glasses will absolutely make her squeal. If she's been especially sweet, bring along a bottle of bubbly and christen those new coupes! Pretty polishes wrapped up in a bow make a darling (and fairly inexpensive) gift for the girl who loves beauty products. Top it off with a bit of ban.do sparkle to brighten up those long winter nights, or some sumptuous Wolford tights (I love the Velvet de Luxe 66s) she'll be able to wear at Christmas dinner. For the label-loving gal who loves her iPhone, pick out a cute new cover; I love the tech offerings from Jonathan Adler, Kate Spade and Diane von Furstenberg. Giving her a gift she's sure to see everyday will always remind her how much she means to you, so you can pick up a new leash for her pup, or a sweet charm for her keys. What's your favorite indulgence, or your go-to gift for your best girls? Gift Guide by Chelsea of Buckets & Bunches. I'm so happy you're doing this gift guide because I'm in desperate need of ideas this year. It's actually kind of ridiculous how I have no clue what to give anyone. I love this idea for my sister. Keep it coming! LOVE!!! I just gave a set of vintage coupes & a bottle of champagne to a best friend who just bought a new house!!! Great gifts...esp. love the champer stemware and cava. So luxe! you know that Kate Spade Bubbly Dot Saucer has been on my list for a while now, right? 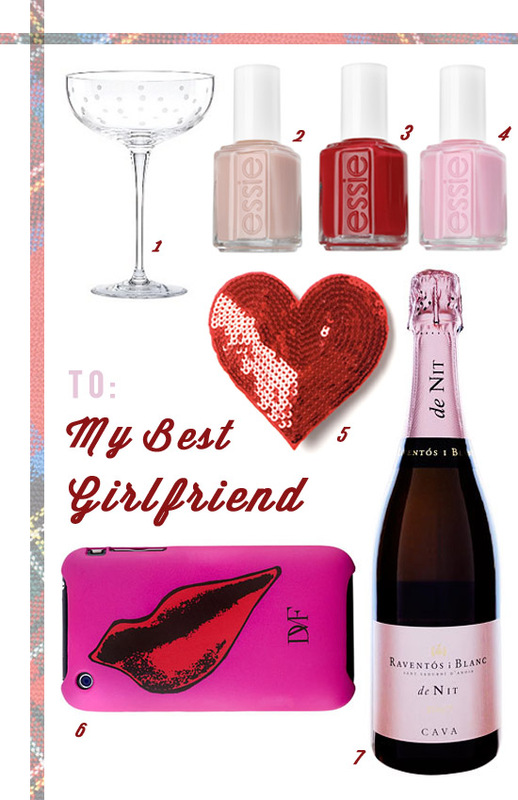 Yes, YES to all of this, especially the oh-so adorable Kate Spade bubbly dot saucer! This is a great list to give my hubs for me :-) But seriously, thank goodness for good girlfriends!! That ban.do heart is already on my wishlist! Is that pale pink bubbly I see?! Cheers! I'll take one of each of these...in fact I won those Kate Spade saucers last year from Hip Hip Gin Gin. They are my faves!! you cant go wrong with booze. ever. Stop by & enter my Shabby Apple Giveaway. i adore this guide!! such perfect choices! The nail colors are fab, could there be any more appropriate shades to add to someone's collection?? I don't have an iPhone but I'm crushing on that case. I die for those coupes! I wait with bated breath for tomorrow's selections! I want all of it! Especially the Kate Spade glasses. They've just opened two Kate stores here in London and I'm dying to go in and bury my credit card... or at least pick up one of the iPhone cases! I'll definitely be taking some inspiration from your ideas for my girls. If this is what your best friend is getting can I get her spot? She can have you back after the holidays...MAYBE!! I'm sure she's gonna fight me for ya! Love the gifts! My best girls and I don't exchange christmas gifts, only birthdays. Which reminds me I have one coming up! I would love all of this! Such great gift guides!